On Saturday night, a friend told me that he’d lost his wedding ring! It had fallen off sometime in the last day but he had no idea where. Earlier that morning, he had taken his son and Jack and another of their friends to Auskick (brave man), and he thought maybe it had fallen off there. But he’d been back to search the oval and had no luck finding it. Ever since he told me, I had a niggling feeling that I should go and have a look at the oval. I ignored it for a while but this morning, the sense that I should go was just so overwhelming. So I planned to go to the shops nearby and thought I could go there on the way home and have a look. Tilly needed some new “splashing boots” and it’s Sebastian’s birthday this weekend so we had presents to get! 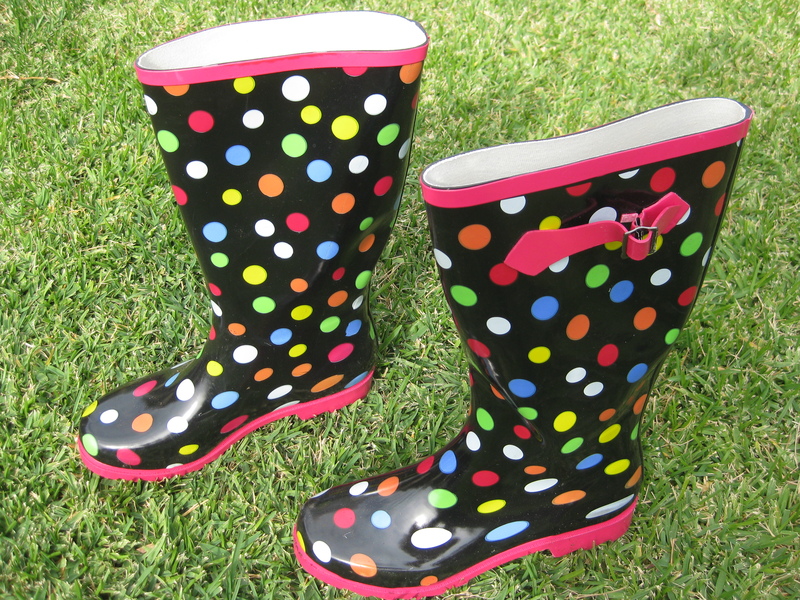 After what seemed like an eternity trawling through Target, we had what we needed (and some), including some pretty special spotty “splashing boots” for me. So we piled back in the car and headed for the oval. After feeding Sydney, Tilly and I both put on our splashing boots and headed out to the oval. It was a good thing I’d been there the week before and had some idea of where to start – ovals are huge! We walked up and down, up and down finding lots of little bits of yellow rubbish… but no ring. We had a bit of a fright along the way when Tilly got bowled over by a big dog who then jumped on top of her and thankfully, started licking her face – you just never know with dogs. All the while we were asking God to show us where the ring was. When we’d searched the oval, we headed back to where I thought the kids would have put their bags. I found some little bit of paper that I was sure had fallen out of Jack’s bag. And then… I found the ring!!!!!!!!!!!!!!!!!!!! I rang my friend’s wife (my BF), and she rang him and he rang me and I rang Cam to share the exciting news. They were so stoked!!! It was going to cost a fair bit to replace and there’s really nothing like your original wedding ring! And I was so stoked, definitely about finding the ring, but probably more about being used by God. I am so glad I listened when God spoke and had the privilege of being able to help. Woohoo! Kind of made me think… it’s a bit like moving to Mozambique. I’m sure that’s where God wants us to go. In a lot of ways, it doesn’t make sense. I’m sure it won’t all go smoothly. It might even mean putting the kids in danger. But I reckon we’ll find gold. Next Next post: My best friend’s husband bought me flowers last week!